It’s been over a year since I read this book and while I know that I absolutely enjoyed it and gave it 5 stars at Goodreads, some of the details are a little fuzzy. This is what happens when you tend to read a lot of fantasy—at some point they all blend together. Which is yet another reason for not waiting a year to do a review. Goldenhand takes place 6 months after the events in Abhorsen. Lirael is now the Abhorse-in-Waiting and one of her first missions is to rescue Nick Sayre who has just been attacked by a Hrule creature—events that are described in the short story The Creature in the Case from the collection, Across the Wall. She helps him as much as she can but realizes that he needs medical attention that only the Clayr can give, so the two travel to Lirael’s former home, the Glacier. At the same time, Ferin races towards the Glacier to deliver a message to Lirael from her mother—a message with apocalyptic visions of the future. Lirael and Nick must again battle Chlorr of the Mask and attempt to defeat her once and for all. 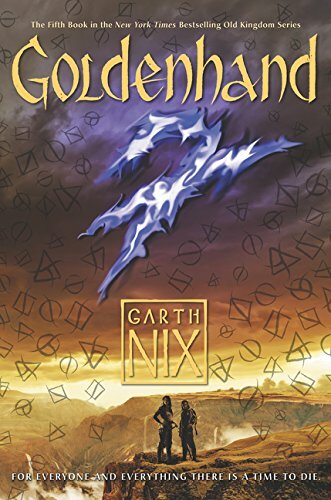 I’ve loved all of Garth Nix’s books. Some more than others, but I honestly have never picked up a Nix book and said, “eh.” Although I can’t remember the minute details, I very much remember being so happy to be back in the Old Kingdom. I loved reading about Lirael and Nick again. This was a satisfying follow up to the original Abhorsen trilogy. "Goldenhand takes place 6 months after the events in Abhorsen. Lirael is now the Abhorsen and one of her first missions is to rescue Nick Sayre who has just been overtaken by a Hrule "
Lireal is NOT the Abhorsen not has Nick been overtaken by a Hrule, i think you need to read the book again. I fixed the Abhorsen bit & changed “overtaken” to attacked.